Unfortunately for the girl, Daddy's birthday fell on a day she had to go to school. We had to promise her that, although Daddy was off, we wouldn't do anything fun until she got home. That said, we didn't do anything fun anyhow, one of us is in desperate need of a new car. 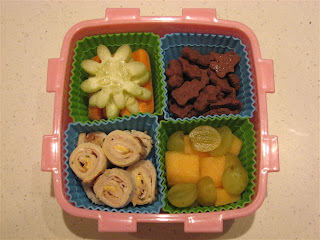 So for school, she took turkey & cheese faux sushi, carrot sticks & cucumber flowers, Teddy Grahams, and grapes & melons. Nothing exciting, but it's almost the weekend.